The Silver Bullet System revolutionizes water treatment. 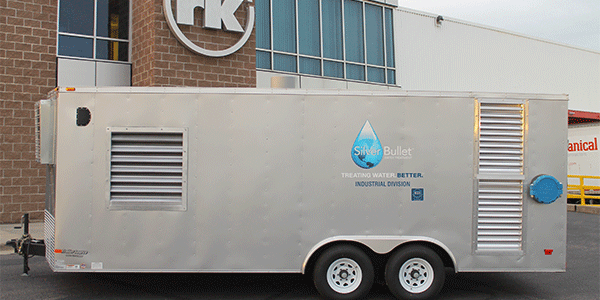 RK Water is the exclusive manufacturer and primary dealer of the Silver Bullet System, a revolutionary evaporative cooling water treatment system that is an environmentally-friendly alternative to traditional chemical-based commercial water treatment. The Silver Bullet System uses Advanced Oxidation Process (AOP). This proprietary technology creates a processed gas from ambient air that is injected directly into the water matrix. Once the gas makes contact with the water, numerous reactive oxygen species occur that assist with microbiological control and scale inhibition. By safely cycling up the water into an alkaline state, the water becomes less corrosive. The Silver Bullet System can significantly reduce cooling tower water usage, resulting in greater efficiency and financial savings—all without adding more chemicals, so it is safe and cleaner than traditional water treatment methods. Installation takes less than a day and can be activated with no disruption to the facility’s existing HVAC or electrical systems. Water systems benefit from reduced scale formation, halted microbiological growth and reduced corrosion of cooling towers. AOP Validation Validated as an AOP by Dr. Karl Lindens’ AOP Laboratory, University of Colorado at Boulder. 2012: Best Venture Award, US Department of Energy’s National Renewable Energy Laboratory (NREL). 2014: The GSA’s Green Proving Ground (GPG) is a yearlong study that validates new energy efficient technologies and accelerates them to commercial viability. The Silver Bullet is currently under a GPG study at the National Water Quality Laboratory in Lakewood, CO.